Korean electronics giant Samsung has rightfully been criticized for tossing devices willy-nilly into the market to see what sticks, but the latest in its Galaxy Tab series could wind up being the company's best iPad deterrent to date. On Thursday night, Samsung unleashed the Samsung Galaxy Tab S, a device the company called its "thinnest and lightest tablet to date, " with a clear focus on making the display one of the best ever available on mobile hardware. There's no denying Apple's Retina Display continues to impress, packing a resolution of 2048 x 1536 pixels into a svelte 9.7-inch diagonal, LED-backlit IPS display for a pixel-dense 264 ppi. For sheer pixels alone, Samsung has Apple beat by just a hair, cramming a slightly higher WQXGA resolution of 2560 x 1600 into the 10.5-inch, Super AMOLED display of the Galaxy Tab S (an 8.4-inch model is also available). Reminding us that consumers have cited the display as "the most important element of a tablet, " the result are brighter whites, richer colors and deeper blacks. With the Galaxy Tab S, Samsung achieves a far more impressive level of detail than we've seen from previous tablets, featuring a crisp, clear display that offers better color saturation with more than 90 percent Adobe RGB color coverage, a contrast ratio of 100, 000:1 and a display that automatically optimizes color range, saturation and sharpness based on the user's surroundings. Although Samsung may have won the first round thanks to a gorgeous display, the overall design of the Galaxy Tab S doesn't quite live up to Apple's traditional elegant design, which is clearly on display with the iPad Air. Featuring a cinematic 16:10 aspect ratio compared to the print-friendly 4:3 screen of the iPad Air, the Galaxy Tab S is impressively slimmer at 6.5mm compared to Apple's 7.5mm frame, while the Wi-Fi only model comes in at the same weight class by nearly matching the latest iPad (469g) at 465g. The result is a tablet that feels better and more balanced in the hand, although the folks in Seoul still can't quite match Cupertino when it comes to overall design chops, so we're handing this round over to Apple. Apple continues to play coy when it comes to processor speed on mobile devices, but anyone who's spent even a few minutes with an iPad Air can attest to the fact that its newly 64-bit A7 chip is a powerhouse. 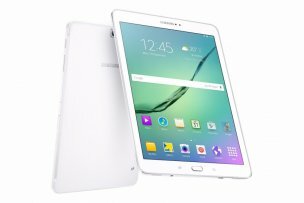 By comparison, Samsung isn't the least bit shy about chatting up the blisteringly fast, quad-core 1.9GHz Exynos 5 Octa processor at the heart of the Galaxy Tab S - although in some regions, that muscle might be substituted for a quad-core Qualcomm Snapdragon 800 clocked at 2.3GHz instead. But specs don't tell the full story here: iPad Air is decidedly slicker while in use, although we'll call this one a tie since the Tab S we managed to spend some hands-on time with is likely running software that may not yet take full advantage of the hardware. The tempered glass screen protector has a strong adhesive that makes installation easy and attaches the film firmly so as to not affect the touch screen s sensitivity.